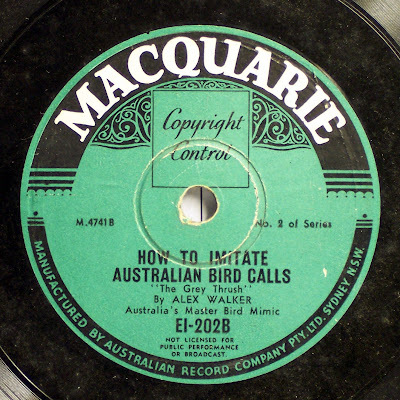 Ok you always wanted to imitate Bird calls, Australian Bird calls right? Some weird "bird call" discs. Now the Label "Macquarie" I think it may be the same Label that ive seen on some Radio TS discs, IE the Aussie Macquarie Radio Network. anyone shed some light on this Label? My Mother bought these discs from somewhere a while ago, Most of the discs were in appalling condition and had great chunks of shellac missing from some of them and of course scratched and worn. I was at a "record shop" in Newcastle late last year and they had one of the "missing Discs" I don't have, they wanted 50$ AU for it!! these cost a few cents each! Her's a shot of a regular 10 inch 78 and this one. Note my "testcard" for lining up "label shots" on my crappy Digital Camera. and lo see how its all out of wack! 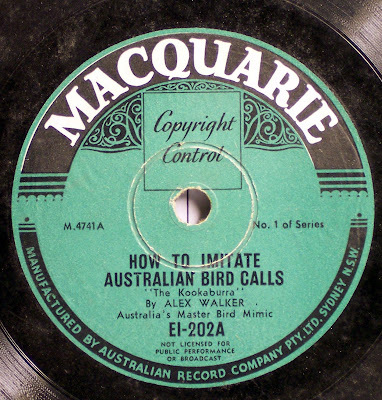 Hi, You asked for some info on the Macquarie record label. This was owned by radio 2GB and used to put out excerpts from their shows. 2GB had two production companies which produced plays on Macquarie and Artransa. The 78s were used to send out these excerpts. I think they shut them down during the sixties, when I worked for 2GB as a production operator. 2GBs slogan was THIS IS THE MACQUARIE BROADCASTING SERVICE. 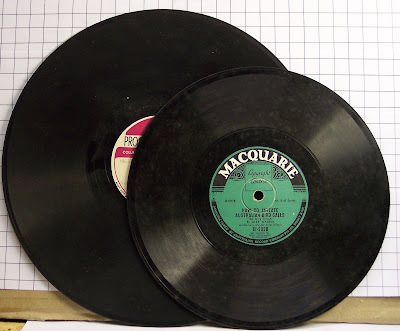 The programs recorded by them in THE MACQUARIE AUDITORIOM (Jack Davey, Bob Dyer all programs with an Audience) went out to stations on MACQUARIE 16 inch discs. They ran for 15 mns per side, and were played with a 78 stlyus. As for Artransa, American grace gibson came out from America to set up a Transcription service for 2GB. She left around 1941 to set up her own production company. She called the company Artransa which stands for American Radio Transcriptions For Australia and New Zealand. They used 16inch discs, and were plays and serials. Both labels issued material taken from 2GB shows that people had made enquireys about. They were sold through regular record shops.Wilbur Kentwall who played piano/organ on Jack Davey shows made a few artransa discs. thanks Bill for the info. See it how History can be preserved? by just a simple email! Cor the mould has really got a hold of that Macquarie disc hasn't it? Do you clean the discs before restoration Ade, or does that not affect the sound so much? Thanks again for another interesting track that I would never have heard had you not worked your magic! oh yeah! the mould, about 80% of the discs ive "layed down" wwre covered in this type of mould, most of em a LOT more. As ive said on other posts, most of the discs I transfer are from people's back sheds or found under their houses exposed to the elements. of course there has been the odd exception but yep, cleaning the disc is a priority as I don't want to damage my stili in any way or grind the dust and crap into the grooves any more than necessary. So they all get a good clean. And if you play em back without cleaning the surface, you can hear the "mould" a LOT!! ive had about 50 downloads of this one and only one comment!! Ted Steele and his Novatones Play Duke Ellingon!